Come and join these diverse pilgrims and share unforgetable moments sipping sundowners at the confluence of the legendary Limpopo and Shashe Rivers, watch the eagles soar over Botswana and Zimbabwe’s skies, hear the echo of elephant trumpets, take a tree top walk or just relax and absorb the surroundings… Mapungubwe National Park and World Heritage Site is rich in biodiversity, great scenic beauty and the cultural importance of the archaeological treasures of Mapungubwe. The Lost City: Visit Mapungubwe Hill, where a far developed African civilisation prospered between 1200 and 1270 AD. The area was already inhabited by a growing Iron Age community from 900 AD and became rich through trade with faraway places like Egypt, India and China. 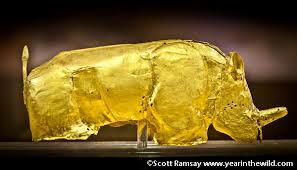 This is the place where archeologists excavated the famous golden rhino and other evidence of a wealthy African kingdom. Wildlife and Mystic Scenery: Sandstone formations, mopane woodlands and unique riverine forest and baobab trees form the astounding scenic backdrop for a rich variety of animal life. Elephant, giraffe, white rhino, eland, gemsbok and numerous other antelope species occur naturally in the area. Lucky visitors might spot predators like lions, leopards and hyenas. Birders can tick off 400 species, including kori bustard, tropical boubou and pel’s fishing owl. The Mapungubwe Interpretation Centre : The Centre which is built near the main gate of the Mapungubwe National Park won the building of the year competition in 2009 and is home to the famous Golden Rhino. The Centre provides both day and over-night visitors the opportunity of a tour, showcasing the amazing landscape that the National Park has to offer. Joining Nations: The Iron Age civilization of Mapungubwe was not limited by the Limpopo river and animals have always been able to wander around in the area of present-day South Africa, Botswana and Zimbabwe. This is why South Africa signed a memorandum of understanding with Botswana and Zimbabwe on June 22nd setting out principles for the Limpopo-Shashe Transfrontier Conservation Area (TFCA).